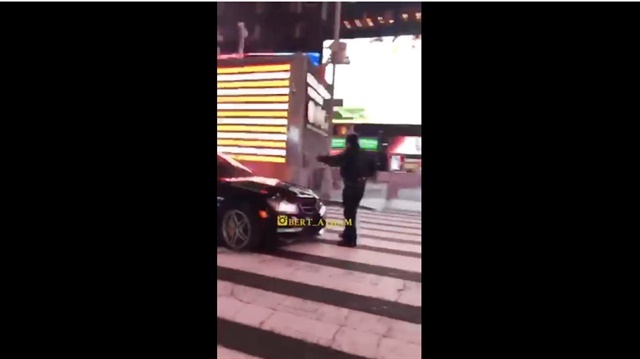 A reckless driver, zooming through Times Square so fast that the tires of his sportscar were smoking, struck and dragged an NYPD officer who tried to stop him, dramatic video footage shows. The incident unfolded in front of the NYPD substation at West 43rd Street as the black Mercedes-Benz C63 with New York tags roared down Seventh Avenue, doing donuts in the street, around 11:45 p.m. Saturday, authorities told the New York Post. The police officer — identified by law enforcement sources as 26-year-old Ian Wallace — tried to stop the vehicle by standing in front of it and ordering the driver to stop. The driver then suddenly swerved left and gunned his engine again, this time getting around the brave officer, who was dragged a few steps and thrown to the ground as the car appears to sideswipe him. Wallace was taken to Mt. Sinai St. Luke’s hospital with minor injuries to his back, arms, right leg and right hip, law enforcement sources said. The driver reportedly side-swiped several vehicle while speeding through traffic and left Times Square. There have been no arrests, and the investigation is ongoing, police said.